Domain Name is your unique identity on the Internet. Any individual, business or organization who plan to have an Internet presence should buy a domain name. Your business look more professional, if you have your own domain name, website and email addresses. The main reason to register a domain name for a business is to protect copyrights and trademarks, build credibility, increase brand awareness, and search engine positioning. 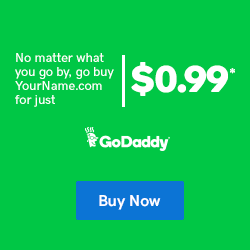 GoDaddy offers 90% discount on .COM Domain Name. This domain is available at $0.99 for the first year, plus ICANN fee of $0.18 per domain name per year. Additional years domain may be purchased for $9.99 per year. To grab this offer, just click on the below domain discount coupon code from GoDaddy. GoDaddy has revised the domain price from ₹ 99 to ₹ 349 for first time buyers. Now they offer 64% discount on GoDaddy .COM Domain Name. This domain will cost you ₹ 349 for the first year, plus ICANN fee of ₹ 12 per domain name per year. Additional years domain may be purchased for ₹ 689 per year. To grab this offer, just click on the below domain discounts vouchers from GoDaddy. Note: GoDaddy promotion discount is already applied on the links. This offer is valid for new domain registration only. GoDaddy discount coupon code is valid for 1-year registration only. GoDaddy $0.99 .COM Domain Name for 1st Year only. .COM just $0.99*! Additional .COMs $9.99* per year! When you buy a domain name at $0.99/year, you get one-month free website builder to develop your websites beautifully without any coding. We have tested all the GoDaddy 99 Cent .COM Domain Names Promo codes and all are working fine. If any of the above promo code doesn’t work for you, do write in comment section. We will search a new coupon code for you. ICANN fee (Taxes) will be extra ($0.18 per domain name per year). GoDaddy do not accept payments from Paypal. These Promo Codes can only be used on new domain purchases only. Discounts can’t be used in conjunction with any other offer or promotion. After initial purchase, discounted products will renew at regular renewal rate. How to Use GoDaddy Domain Promo Code? Just go through the steps and screenshots below to register your domain name with GoDaddy. Let’s take the first step. STEP-1: Visit GoDaddy website to get 99 cent domain deals. In the Domain Name Search field, enter the .COM domain name you want to register, and then click Search. If the domain name you requested is already registered, GoDaddy provide available you some related alternatives. If the domain name is available, follow the instructions to complete the checkout process. STEP-2: Add the domain to your shopping cart, then click on continue to cart. STEP-3: On the next page, at the right hand side you will see an option to enter the promo code. 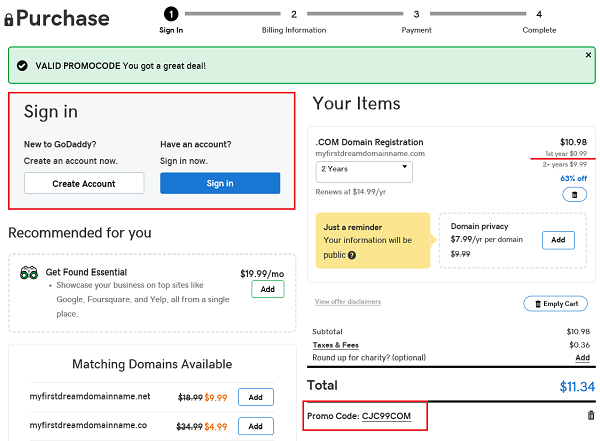 If the promo code is not applied automatically, then you need to enter the GoDaddy promotional code (CJC99COM) manually to get .com domain at 99 cents. Now at the left hand side of this page, you will see create an account and sign in option. As GoDaddy promo code is applicable to new users, so first create an account with GoDaddy. STEP-4: Fill the complete Billing Information and be sure to include valid contact information for each contact. The Internet Corporation for Assigned Names and Numbers (ICANN), the governing body for domain names, requires valid contact information (registrant, technical, billing, and administrative). STEP-5: Final step is to make the payment. The payment can be done through Credit Card, Debit Card, Net Banking, PayTM or any other popular mobile Wallet. All Visa/Mastercard credit/debit cards are accepted. You can not make payment through PayPal. Congratulations!!! Your GoDaddy Domain Name registered successfully. Now you can start your online blogging/business journey with GoDaddy. If you have any query/suggestion related to GoDaddy Domain Promo Code, write us below in comment section. We will help you in buying a cheapest domain name. GoDaddy is world’s largest domain name registrar. They offers huge discounts on Domain and Web Hosting Plans. 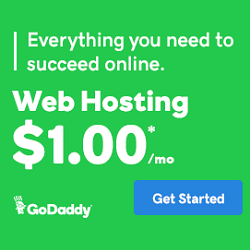 You can get .COM domain at 99 and web hosting at $1. This is the highest discount offered by any web hosting provider. Click here to avail GoDaddy 99 cent domain name. If you have any query about GoDaddy domain coupon, do write in comment section.